H.R. 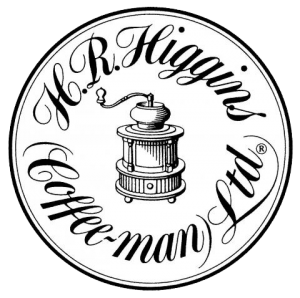 Higgins (Coffee-man) is arguably the best coffee emporium in London and has been importing the best beans and making the finest blends for three generations. Now run by David Higgins, grandson of the founder, Harold R Higgins, the business has a devoted and loyal clientele all over the world and a much prized Royal Warrant to supply coffee and teas to HM The Queen. At their Mayfair shop one can discover a vast collection of teas and coffees from all over the world. The knowledge and authority with which David Higgins sources, selects and creates his perfect roasts and delicious blends has been likened to a great sommelier or oenophile creating a world class cellar of vintage wines. However, there is no stuffy formality or snobbish attitude here, rather a welcoming and enticing atmosphere of a quiet family run business with great heritage and respect for the past whilst developing a keen eye on the exciting trends and potential of the coffee industry of the future. The shop on Duke Street, W1 has completed a redecoration and which sees a contemporary reworking of their coffee and tea shop situated in the basement. David has collaborated with celebrated fashion, print and textile designer, Ann Louise Roswald on the identity and layout for the cafe. A specially commissioned, custom fitted X-one TCI coffee machine from Conti Espresso will also ensure the flavours, and aromas that genuine coffee lovers look for are guaranteed. David’s latest project sees him working with the Grosvenor Estate (the landlord for the majority of Mayfair) to develop a unique coffee blend to offer to their clients. One which will reflect the character of the Mayfair estate. It will be jointly branded and will reflect the authoritative, confident and iconic nature of this part of London. The Mayfair brand character could easily describe H.R.Higgins own mission statement – understated elegance expressed in a subtle and effective way using less to achieve greater impact.